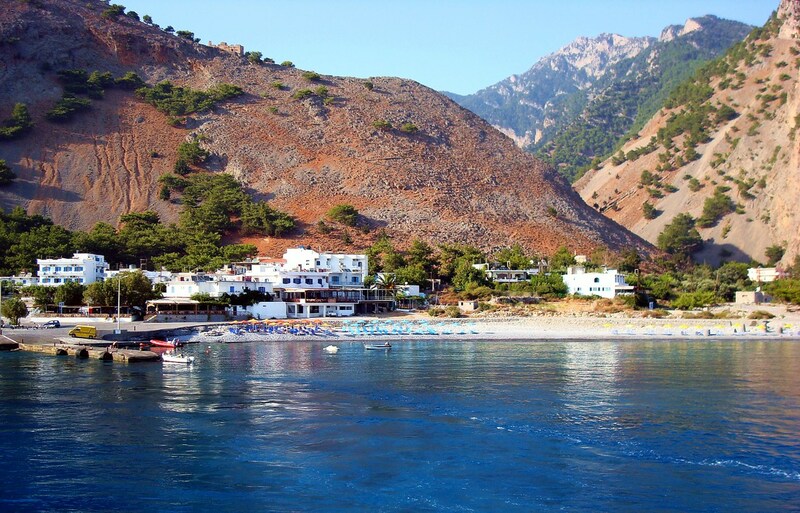 Most of the 170,000 visitors (1,000 a day in peak season) per year who walk the gentle downgrade of Crete's spectacular Samaria Gorge, upon reaching Agia Roumeli, the little settlement on the coast of the Libyan Sea on Crete' south coast, promptly take a ferry to some other place in Crete. Which is rather a shame, as Agia Roumeli is a pretty decent destination all by itself. This remote village is reachable only through the Gorge, or by boat. There are no roads in or out. Cut off from the rest of the world by the White Mountains (Lefki Ori), Agia Roumeli was the first place in Greece powered by solar energy, from 1982-1989. The way to get to Agia Roumeli is either through the gorge (entering around midday will allow you to do the trek without a lot of other people, arriving at Agia Roumeli just as the last of the hikers are taking the boat out). 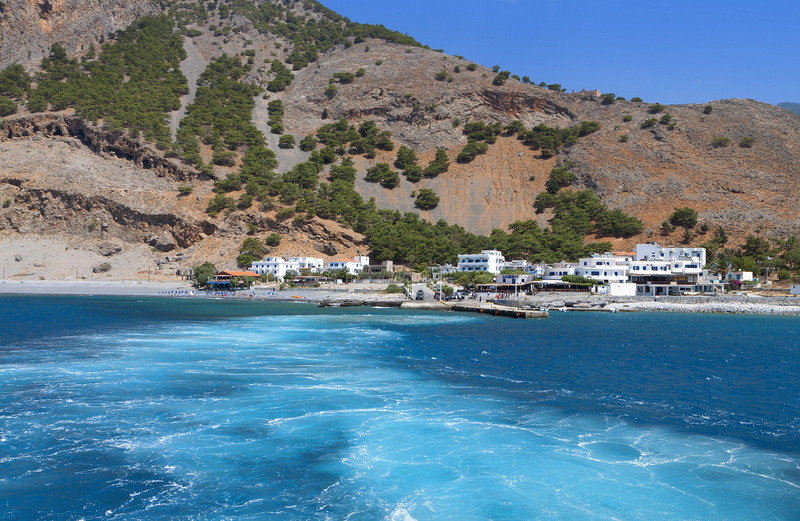 Another way to get to Agia Roumeli is by boat from Chora Skafon, 20 km along the coast to the east. Daily boats also come from Paleochora and Sougia, 25 and 15 km west, respectively. 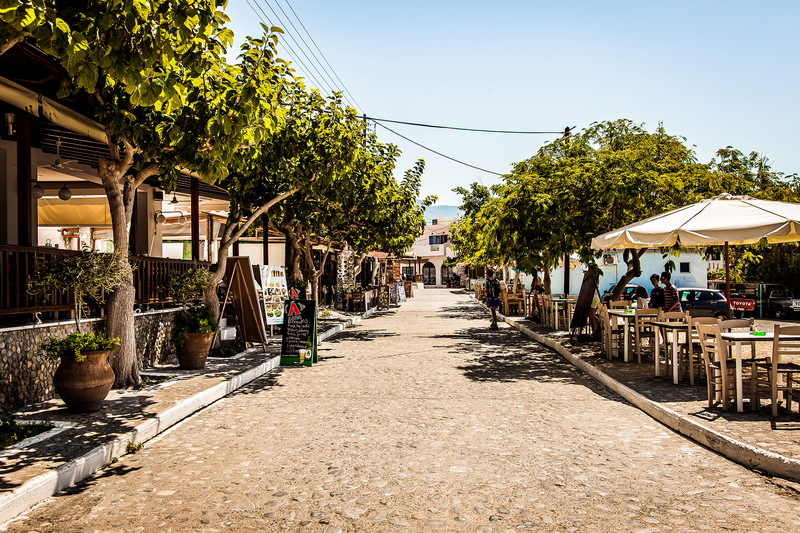 Those last two leave in the AM and head back in the PM, which are perfect if you want to do just a day trip to Agia Roumeli. Agia Roumeli's jetty is not protected by a harbor breakwater, which halts all boat traffic during high winds, and which could strand you for a day or two. 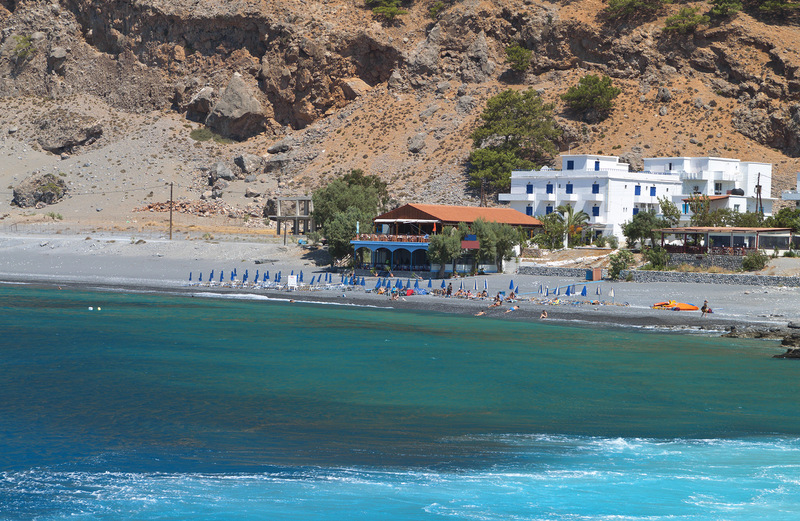 Agia Roumeli in its present form is a new settlement, dating from 1954. The original village was about a kilometer up the gorge from the coast, but constant flooding from the Samaria river did so much damage that the residents just picked up and moved to a safer place on the water's edge and further west of the river bed. 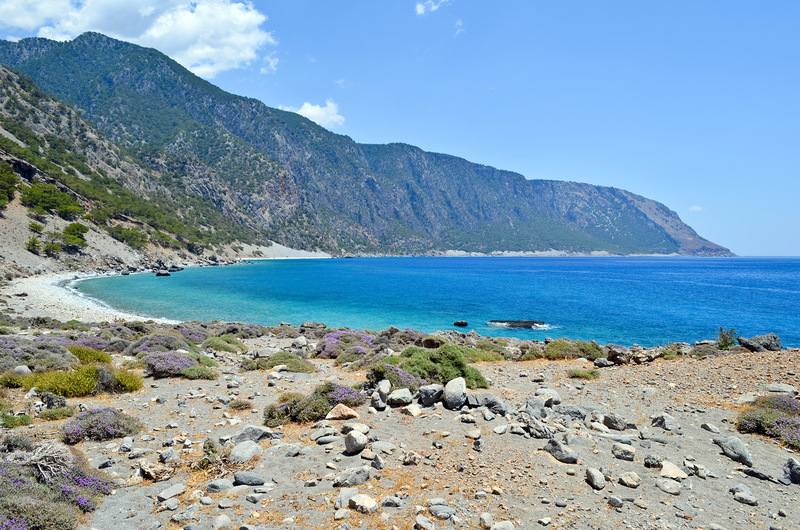 East of Agia Roumeli was the ancient city of Tarra, dating from around 400 BC. Tarra's cemetery is being excavated on the site of modern Agia Roumeli. The topography has changed, however, due to a major earthquake in 365 AD which raised western Crete by 4 meters. Tarra was important enough to found a couple colonies, in Italy, and in the Caucasus Mountains. Apollo Tarraeus (Apollo of Tarra) was worshipped in Tarra. Mythology says that Apollo fled to this place after killing the Python at Delphi. A priest-seer named Karmanor is supposed to have performed purifying rites on Apollo's behalf. While there he fell in love with Acale, daughter of Minos. Her embrace so mesmerized him that he forgot to bring the sun up, delaying sunrise for some time. People think this is a mythic way to explain why the sun takes so many hours each day to reach the floor of Samaria Gorge. The Venetians and Turks had a shipyard at Agia Roumeli to take advantage of the timber of the slopes on the nearby mountains. Something else of historical significance, taking place in the 20th century, was the departure of the Greek government with King George from Agia Roumeli for Egypt in May, 1941, after Crete fell to the Nazis. An overnight at Agia Roumeli is a chance to mingle with the locals, proud Cretans who sing the praises of their mountains. A walk under the brilliant carpet of stars on a clear night is unforgettable, as there are few sources of man-made light to dim the view of the Milky Way. Southern Crete is famous for its night sky. The pebbly beach is usually empty until the first hikers begin arriving at midday, lounging around on their packs, awaiting their boats. There is an old Turkish fortress uphill from the village giving a fine view of the gorge's mouth, and of the ruins of the temple to Apollo Tarraeus there. There is also a Byzantine-era Church, Agios Pavlos, where local legend says that the Apostle Paul landed and baptized new believers. Indeed the Book of Acts in the New Testament describes a trip the Apostle made along the south coast of Crete, on his way to trial in Rome. Agia Roumeli. It's worth more than a short visit.